We are delighted to be able to offer laser therapy with our Class IV Therapeutic Laser at East Sussex Osteopaths. Laser Therapy is also known as LLLT or Low Level Laser Therapy or Cold Laser. This non-invasive treatment promotes rapid healing, enhances cell growth, prevents scar tissue forming and reduces inflammation and pain associated with sprains, ligament and capsular injuries, without the need for medication or surgery. These lasers provide a level of versatility unrivalled by other lower class lasers, as they can penetrate deeper into the patient’s tissue. The Medical Laser Therapy system sends beams of light energy (photons), deep into tissue without causing any damage. These photons are absorbed within the mitochondria of the cells and induce a chemical change called “photo-bio-modulation”. This light energy then inspires production of ATP in the cell. ATP is the fuel, or energy, cells need for repair and rejuvenation. Impaired or injured cells do not make this fuel at an optimal rate. Increased ATP production leads to reduced pain and inflammation and increased healing speed. Laser Therapy is conducted whilst the Osteopath or Masseuse articulates the area being treated, as this improves the results of each treatment. The beneficial effects of laser light on tissue were first recognized almost forty years ago. Since then, there have been thousands of studies documenting the positive effects laser light has on different types of cells, tissue, and disorders. Recent advances in technology and manufacturing have made it possible to have this exciting modality available. Laser therapy is a non-invasive technique to help reduce pain and inflammation. It can be safely used as an adjunct or replacement for pharmaceutical drugs. Laser therapy treatments last between 5 and 10 minutes depending on the condition being treated. Laser therapy treatments must be administered directly to skin, as laser light cannot penetrate through layers of clothing. You will feel a soothing warmth sensation as the therapy is administered. Laser therapy allows your body to utilize its own healing powers by inducing a series of healing responses in your body by modulating cellular activity leading to decreased pain and inflammation. Depending on the condition being treated your therapy may be administer through either a contact or non-contact hand piece. The contact hand piece is designed to allow the practitioner to physically manipulate the tissue while administering the treatment, resulting in a laser-massage treatment. This allows for light to penetrate deeper into tissues than the non-contact hand piece due to its ability to displace tissue through a laser-massage technique. If you’re feeling pain, have inflammation or recovering from a wound, the laser is a sterile, pain-free, surgery-free, drug-free treatment. The laser is used to treat a variety of injuries, wounds, fractures, neurological conditions, numerous dermatological problems and pain. Whether you are rehabilitating from trauma or injury, healing from a wound, or simply feeling the aches and pains from the aging process, the laser has been shown to provide relief and rapidly speed up healing. How long does the treatment take and how many sessions will I need? Most patients see results within 3 to 5 treatments but treatment protocols are unique to each patient and condition. Your osteopath will develop a treatment plan that is right for you as treatments will vary in time, complexity and cost. For some chronic patients, multiple joints will be treated during one laser treatment session. When appropriate, laser therapy can be used as a complementary treatment alongside other therapies such as osteopathy and massage. LiteCure Medical lasers are cleared by the FDA and adhere to strict ISO standards in order to provide you with the safest non-invasive treatment option on the market. 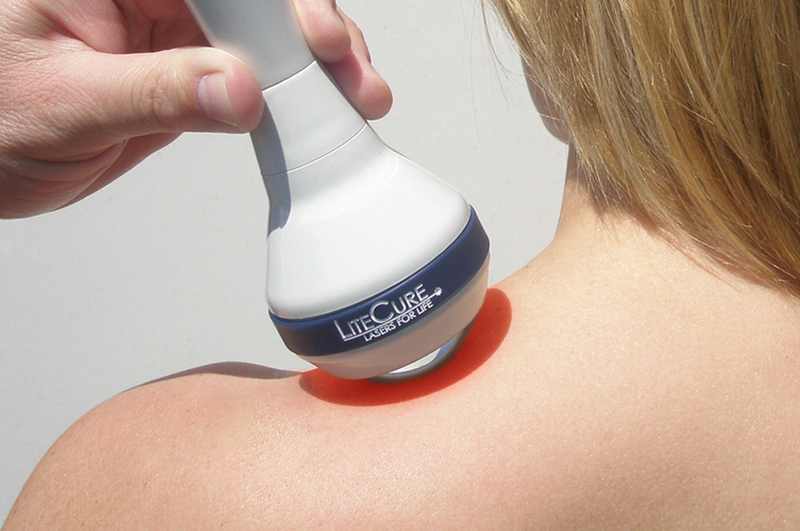 Laser therapy provides you with a safe and effective alternative to medicines and surgery. So there are no known side effects with this treatment. Is there medically documented evidence to support this therapy? Yes, there are many documented medical journals and case history’s to provide evidence this therapy works. Athletic trainers such as, the NFL, FIFA, numerous Olympic teams and the NBA have been integrating Laser Therapy into their pain management plan for the prevention and treatment for their athletes injuries. Below is a link to just a few of the medical Journal publications, illustrating the supported evidence for Laser Therapy on human injuries.